Welcome to the second annual brunch week hosted by Terri of Love and Confections and Susan of The Girl In The Little Red Kitchen! All week, we’ll be celebrating the scrumptious, lazy morning, savory & sweet goodness that is brunch. We have 32 bloggers bringing you their best brunch game, including everything from cocktails to eggs benedict to donuts. Our amazing sponsors have also donated some great prizes for a gigantic giveaway, so please head over to the giveaway page to find out more. 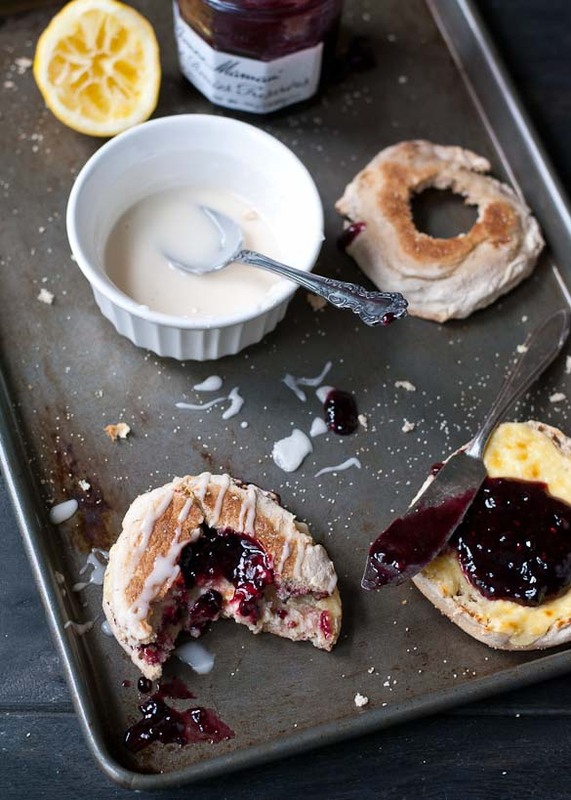 These warm Berry Cream Cheese Danishes are made in only 10 minutes, thanks to a little help from English Muffins and your broiler! Fun fact: My dad has 13 brothers and sisters. That’s right: t-h-i-r-t-e-e-n. And my grandma, who I am quite sure is enjoying an eternity of massages and three course meals, cooked breakfast for all of them every morning. My grandmother passed away before I was born, so I never got to meet this saint of a woman. But if I could have met her, I would have given her a great big hug, sent her off to an all inclusive resort, then introduced her to these 10 Minute English Muffin Berry Cream Cheese Danishes. This is the kind of recipe you can make for 14 kids and not want to crawl into a hole afterwards. It is beyond easy to throw together. First you slice the English Muffins and cut a small hole out of the center. (This is totally optional, but I like being able to see the jewel-toned jam!) Then you stir together a little cream cheese, sugar, and an egg yolk and spread it over all the nooks and crannies of the bottom slices. Everything gets broiled until the cream cheese mixture is puffy and just slightly browned (which takes about 3 minutes). 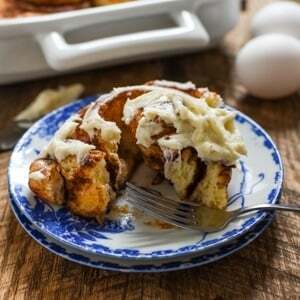 While the creamy centers are baking, you whisk together an easy peasy powdered sugar and lemon juice glaze. After that it’s just assembly. Dollop of jam. Sandwich. Drizzle. Done. It’s so easy, you could have your (14) kids make it. The result is similar to a danish but with about 1/20th of the work. 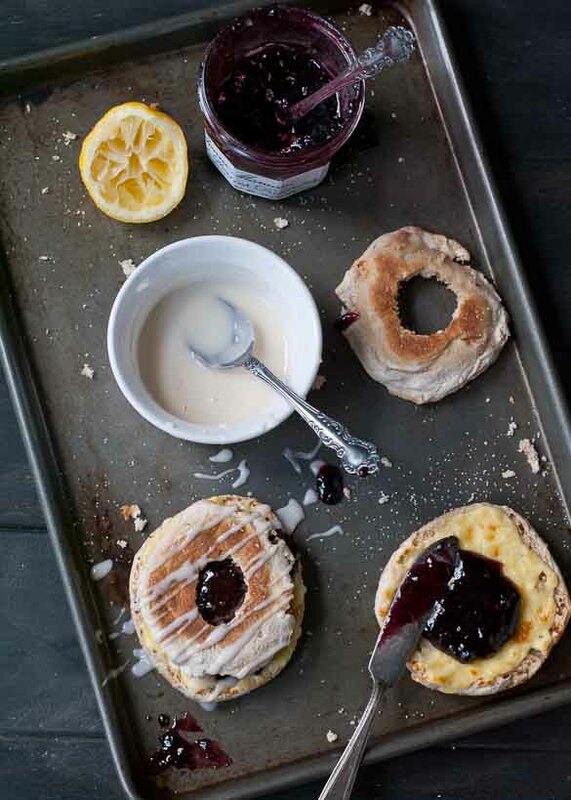 Warm, creamy centers studded with berry jam and accented by a bright, sour lemon glaze. This is how you make brunch special without making it overwhelming. This recipe only makes 6, but it’s a cinch to double or halve the recipe based on how many people will be devouring them. And since everything gets baked on a single tray, you don’t have to worry about waiting by the toaster or making loads of extra dishes. 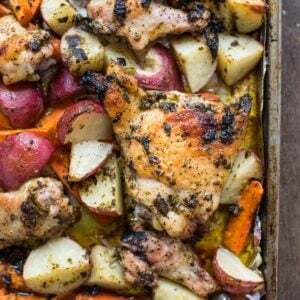 So whether it’s just you or it’s you, your neighbors, your best friend, that one stranger you met, and your fourteen kids, this recipe has got you covered. Here’s to amazing grandmothers, beautiful brunches, and doing it all without having a breakdown. Slice the English Muffins and cut a small hole out of the tops if desired. I used a large piping tip for this. In a small bowl, stir together the cream cheese, egg yolk, and sugar. Spread the cream cheese mixture over the bottoms of the English Muffins. Place both the tops and the bottoms on a baking sheet face up. Place under the broiler (at least 4 inches away) and broil until the cheese is puffed and browned, about 3 minutes. Meanwhile, whisk together the powdered sugar, lemon juice, and vanilla until smooth. 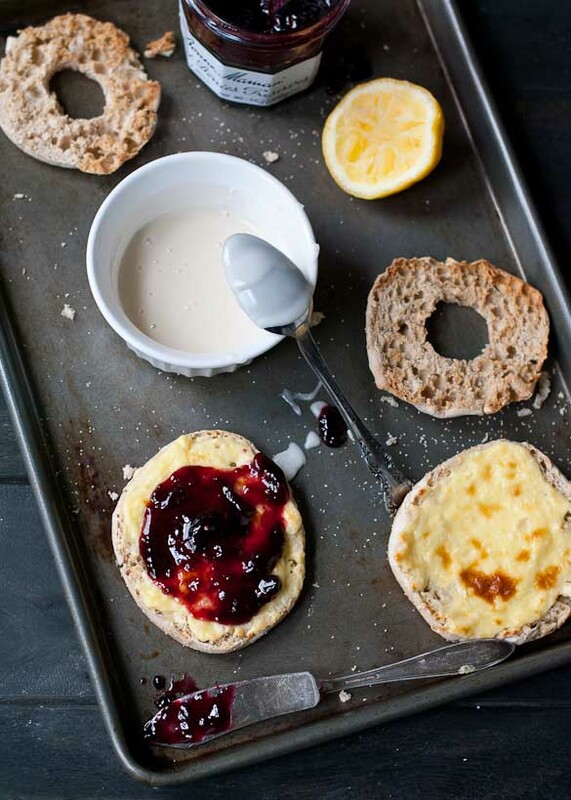 When the muffins are done, place a dollop of jam in the center of each of them and sandwich with the top slices. Drizzle glaze over top. Serve immediately. Broil at about 6 inches away for 3-5 minutes. 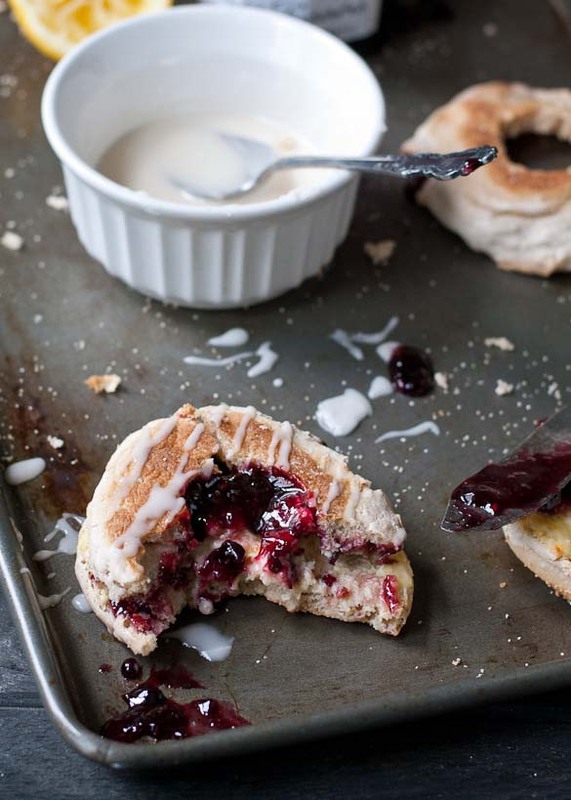 10 minutes to creamy, berry breakfast glory? count me in! Pinned! 14 children? That makes my uterus ache 😉 These look like a terrific, quick breakfast…so yummy, too!!! These would be dangerous to have around. My first cousins had 18! I think I’ll stay with my 1. 14?! What the haaaaay!! LOL These look absolutely amazing! Um…I’m in pain just thinking about having 14 children. 🙂 But I don’t need to have any to want to eat this!! Haha! I know right? That’s A LOT of kiddos! 13 brothers and sisters?!!! Holy cow . . !!! and you’re right . . this is just the kind of breakfast to feed to all those hungry mouths!!! love this! 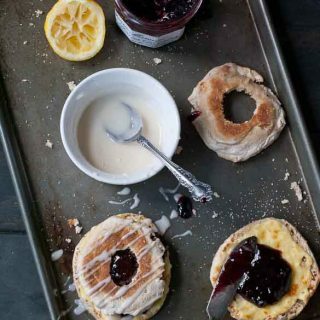 What a fun way to jazz up english muffins! Such gorgeous photos! I love english muffins! Pinned! Your family reunions must be off the handle! I can’t believe the love and care of your grandma. She is 100% a saint! will go crazy over this one. 14 kids?! That is amazing. I am just in awe. I can barely get breakfast on the table for two!! Well, maybe if these English muffins were involved. Because EASY and YUM. 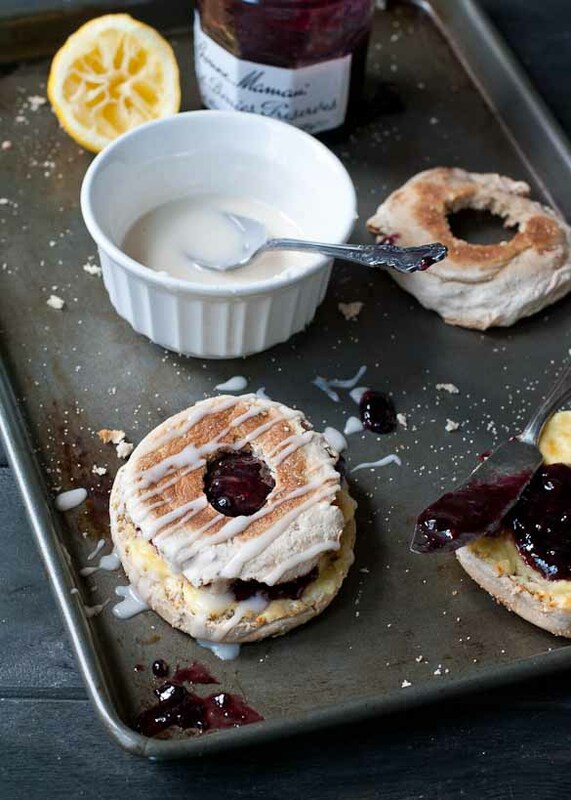 English Muffins + Cream Cheese = delicious. Adding jam and glaze simply takes it over the top. Love it! I like the sound of anything that only takes 10 minutes. Plus everything here is YUM times a million.